Aquaculture is an important economic activity in many countries but there is a need to develop more sustainable practices in order to secure the industry’s future. To address this issue, the Crawford Fund sponsored University of the Sunshine Coast staff Dr Nguyen Hong Nguyen, Prof Abigail Elizur and Associate Prof Wayne Knibb to conduct a training workshop in “Reproductive and Genetic Technologies to Promote Sustainable Aquaculture” in Hanoi, Vietnam. 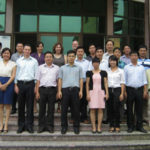 The training included 24 participants from seven different aquaculture research centers and departments in Vietnam. Focusing on advanced reproductive and genetic technologies for aquatic animal species in Vietnam, the course received positive feedback from all participants. “This successful event enhanced the training and capacity of local staff to implement genetic improvement programs for important farmed aquaculture species such as tiger prawn, white leg shrimp, stripped catfish and barramundi. It also provided opportunities for USC staff and participants to exchange practical experience in order to identify research priority areas for future expansion of the collaborative program,” said Dr Nguyen Hong Nguyen. Other training program outcomes include the development of a network of genetic researchers distributed across research institutions, universities and government agencies in Vietnam. In particular, the program has enabled lecturers from the participating universities to develop quantitative genetics courses for undergraduate and postgraduate students at their respective institutions throughout the country.